So you get the idea, right? 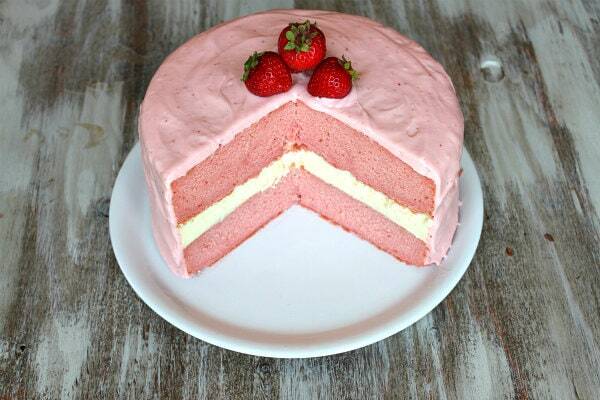 Two layers of cake with a layer of cheesecake in the middle. Covered with frosting too. I love these cakes best since you get both cheesecake and cake in the same dessert. 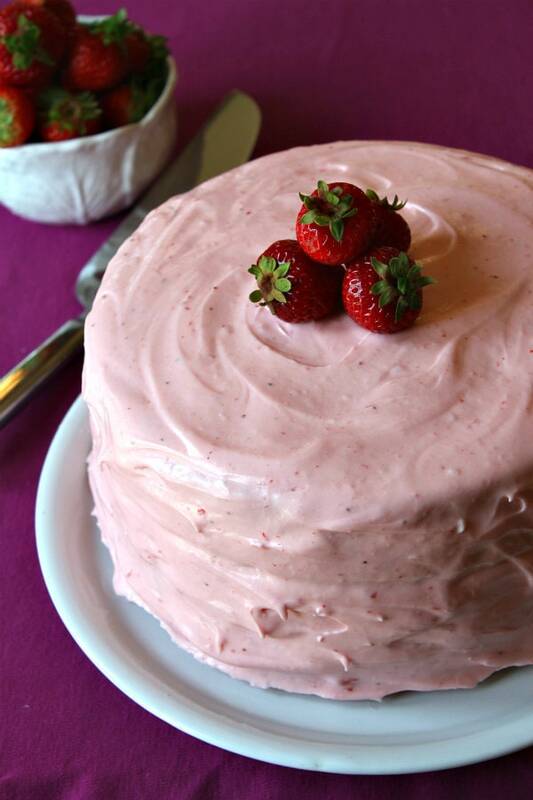 This version sports a strawberry cake, classic cheesecake and strawberry buttercream frosting. One of the keys to making this sort of cake successful is to make nice, even layers. Even layers can be accomplished by using insulated bake even strips. Invest in them and your cake-baking life will be changed forever. Trust me, they work! I wasn’t super duper happy with the cake recipe I tried. It made too much batter and the resulting cake was much too dense. It was yummy, just too dense. So I’m going to go ahead and suggest you make THIS ONE from the blog- Confections of a Foodie Bride. 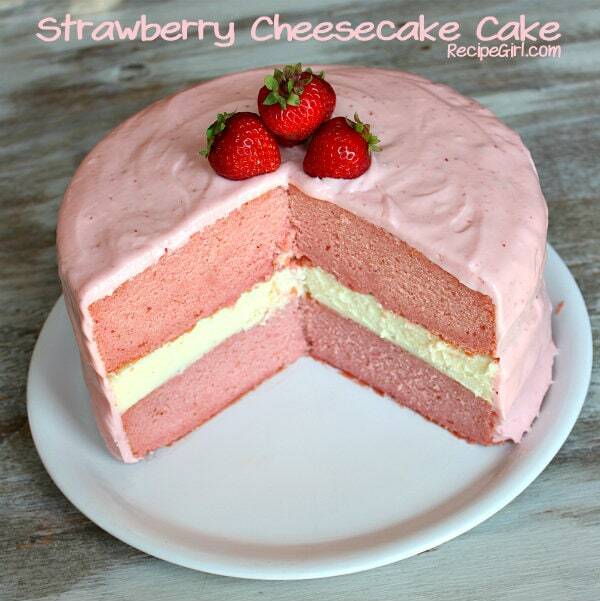 Just print out her recipe and use those two cake layers to make this cheesecake cake. 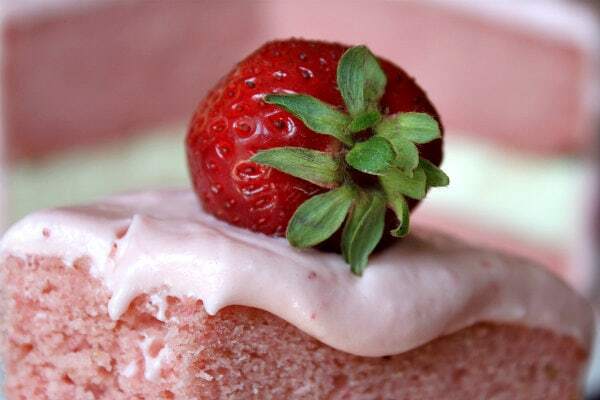 If you’re one of those “I only use box mixes!” kind of people, you can certainly use a strawberry cake box mix for this recipe too. 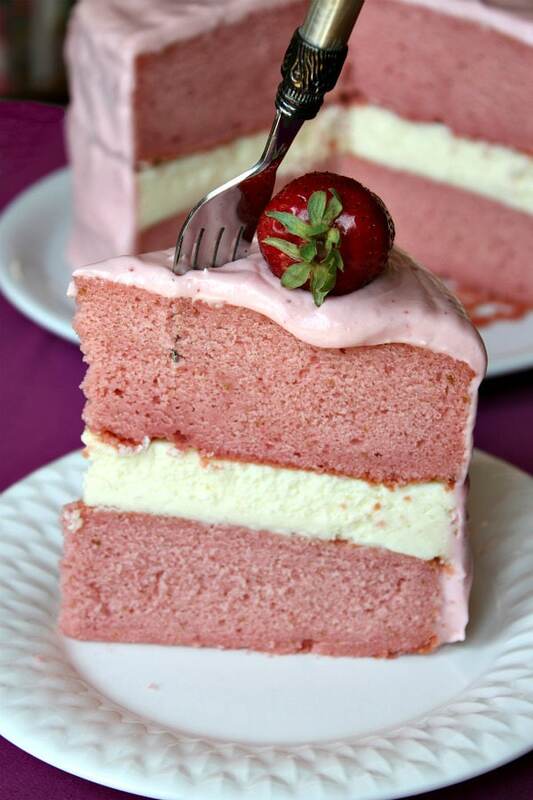 It’s flexible… you just need two 9-inch round strawberry cake layers. 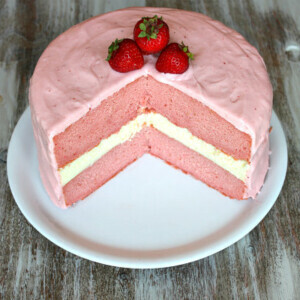 Strawberry frosting just gets plopped on top (no need to frost in between layers as you usually do for a layer cake since that cheesecake layer will be enough to sandwich the two layers together). Spread the frosting over the sides and cover the whole cake with it. See those strips of waxed paper that are tucked under the sides of the cake? That’s my secret for making sure your platter stays clear of major frosting smudges. After you frost the cake, just slip out those pieces of waxed paper and toss them. Then you’ll have a pretty cake on a clean platter! Decorate with a few fresh strawberries, and you’re good to go. Some white chocolate shavings would be good on here too. Cut into slices and serve. Or refrigerate until you’re ready to do so. I’m having a hard time deciding if this is my new favorite cheesecake cake, or if one of those others I’ve made is better. This one is sure pretty for a girl’s birthday (or baby shower), and it’s a fun summery sort of cake when the need for something summery strikes. Oh, and don’t let the long instructions scare you. It’s very simple to pull off… just follow each step as directed and you can create this beautiful cake too. ENJOY! See *Tips below if you prefer to use a boxed mix. 1. Prepare the cheesecake layer: Preheat the oven to 325dgF. Place a large roasting pan on the lower third rack of the oven. Place a kettle of water on the stove to boil. Spray a 9-inch springform pan with nonstick spray. Wrap a double layer of heavy duty foil around the bottom and up the sides of the pan (you want to seal it so the water from the water bath doesn’t seep into the pan). In a large bowl, use an electric mixer to blend the cream cheese until it is smooth and creamy, 1 to 2 minutes. Mix in the sugar and salt and blend for 2 minutes, scraping down the sides of the bowl to make sure all is mixed in. Add the eggs, one at a time, blending after each addition. Finally, mix in the sour cream, whipping cream and vanilla (and food color, if using). Mix until smooth. Pour the batter into the prepared pan. Set the pan into the roasting pan in the pre-heated oven. Carefully pour the hot water from your kettle into the roasting pan. 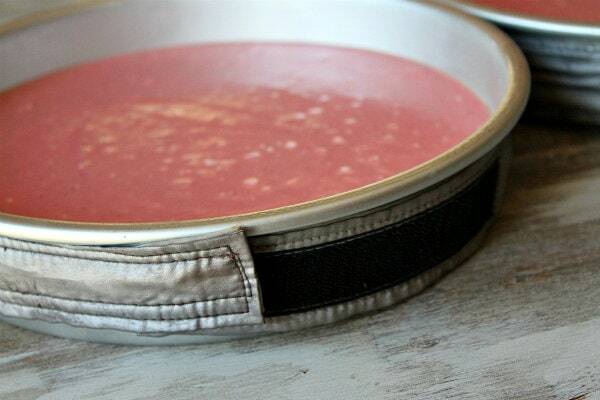 Pour enough water so that there is about an inch of water coming up the foil along the sides of the cheesecake pan. 3. Prepare the frosting: Use an electric mixer to combine the cream cheese and the butter, and beat until smooth. Add the vanilla, strawberry puree and cream and continue to mix until well combined. Mix in 2 cups of the powdered sugar. Add the third cup a little at a time until you reach a consistency that you're happy with. You may not use it all, or you may use more. It just needs to be thick enough to be spreadable. 4. 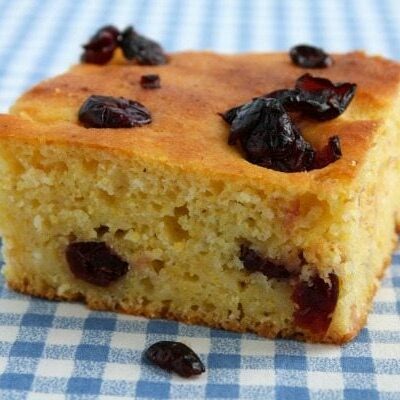 Assemble the cake: Place one cake layer into the center of a cake plate or platter. Remove the cheesecake from the freezer, take off the sides of the pan, and slide a knife under the the cheesecake to release it from the pan. Trim the cheesecake, as needed to match the size of your cake layers (see *Tips). Place the cheesecake layer on top of the first cake layer. Place the second cake layer on top of the cheesecake. 5. Frost the cake: Apply a crumb coat layer of frosting to the cake (see *Tips), and refrigerate the cake for 30 minutes, or until the frosting is set. Apply the second layer of frosting, if needed. Decorate, as desired, and refrigerate until ready to serve. *If you prefer to use a boxed mix, it will work just fine (just make two layers in two 9-inch pans). Here's a link to a jazzed up box mix that has good reviews too. 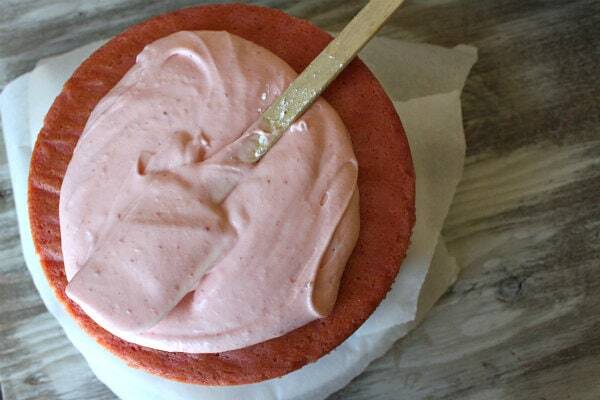 *How to apply a crumb coat layer of frosting: use a long, thin spatula or knife to cover the cake completely with a thin and even layer of frosting. Wipe off the spatula each time you’re about to dip it back into the bowl to get more frosting (this way you won’t be transferring any pink crumbs into the bowl of frosting). Don’t worry at this point about the crumbs being visible in the frosting on the cake. When your cake has a thin layer of frosting all over it, place it into the refrigerator for 30 minutes to “set” the frosting. 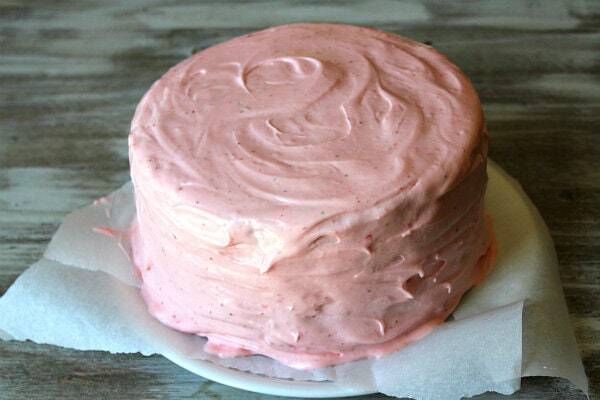 Once the first layer of frosting is set, apply the second layer. Great cake! I changed it a little! I used a White Cake mix. I’m a horrible “scratch” cake baker! Never could get one that came out edible!! So I gave the icing and cheesecake layer a little more flavor with strawberry flavoring in the icing and I made the strawberry purée with some fresh strawberries that I had frozen from the Summer and they were still perfect and perfect in the purée! I have tried this Cake with other flavors like Key Lime. I used a really nice Key Lime Juice called “Nellie and Joe’s Famous Key Lime Juice”. It’s a little pricey and a little difficult to find but it’s so worth it! I tried this cake with Lemon too! It’s great for Summertime gatherings or when you need to bring something to a party! All in all….my family and friends loved all the different flavors of this cake/cheese cake I made and have even given me flavor suggestions and one friend had me make her one for her wedding (second wedding that is). 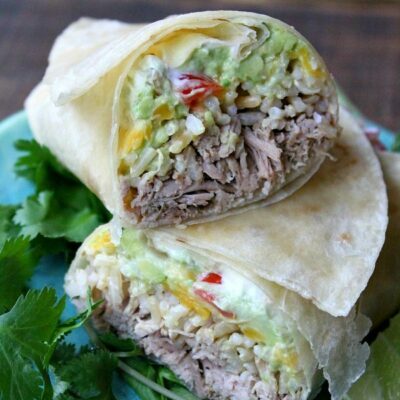 So, this recipe not only is versatile but loved!!! 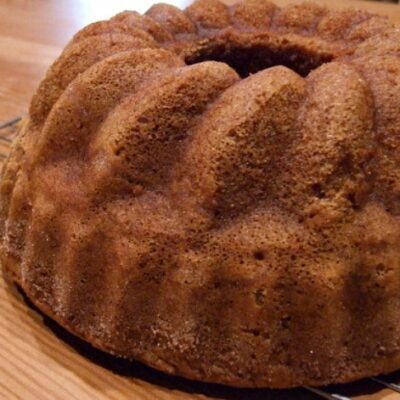 Once the cake is frosted and taken out of the refrigerator will the frosting melt/run? I would like to make this for a birthday party and would like to leave it out till ready to serve. The frosting will not melt, but it’s generally a good idea to keep it refrigerated as close to serving time as possible since there is cheesecake in the middle. If it’s out for an hour though, it should be fine! Can you use a no bake cheesecake mix for the middle layer? Have 2 boxes & trying to figure out something to do with them other than standard cheesecakes. They might be a little soft – this recipe needs a good, firm cheesecake for that middle layer. 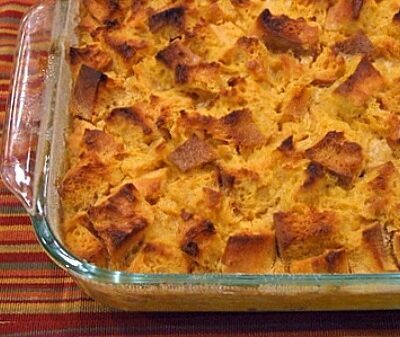 I’m so excited to make this recipe! I did notice that what to do with the butter is left out in the directions for the cheesecake. I’m assuming you cream it with the cream cheese at the beginning. But the directions might need a little editing for less seasoned bakers. Hi Lora, there is no butter in the cheesecake… where are you seeing butter? Hi, I like strawberries, and this looks delicious! Pinned.